Our company started with making tools for stone processing, enlarged products scope to general industrial machinery, and began to base our business upon forgings for shipbuilding, aircraft and nuclear industries. Today, more than 70% of our free forgings to which we are fully committed are metals hard to work like titanium and superalloys.Those exotic materials get more diversified from year to year. In recent years, our technology and equipments with original ideas have drawn attention from every corner of industry, and contracts are made in increasing numbers to forge test parts for R&D purposes in various industries. This is the largest forging press that Nakamura Ironworks owns, which applies 6300tons pressure in ordinary forging, and 8000tons pressure in upset forging. This press can carry out billetting from an ingot up to 45 tons in conjunction with a 45tons manipulator. Use of self propelled manipulators enables this giant press make ingot billeting, bar forging and other types of large size free forging such as rings, discs and other shapes. 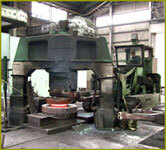 This is the forging press which applies 3000tons pressure in ordinary forging, and 4000tons pressure in upset forging. This press can carry out billeting from an ingot up to 20 tons in conjunction with a 20tons manipulator. Use of self propelled manipulators enables this giant press make ingot billeting, bar forging and other types of large size free forging such as rings, discs and other shapes. 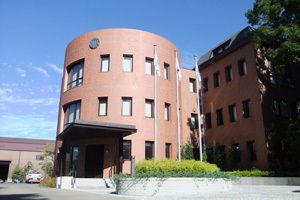 Installed in 1982 and overhauled in 1999. With the use of 7.5 tons self propelled manipulator, billeting of an ingot up to 9 tons is possible. A variety of free forgings are available, such as bar, hollow block, ring up to a diameter of 2000mm, disc and other shapes. In conjunction with a 2 tons self propelled manipulator, this forging press can carry out billeting of an ingot up to 3tons, bar forging and other free forgings such as pipes, rings, discs, etc. In addition to conventional oil hydraulic mode, a high speed crank mode has been accommodated to this forging press, resulting in a special forging press unique to Nakamura Ironworks. When driven by the crank, a high speed forging of 90 strokes per minute can be achieved, making it easier to forge difficult-to work materials. 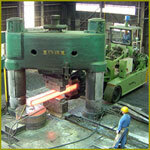 With the help of a manipulator, this forging press carries out bar forging very efficiently. 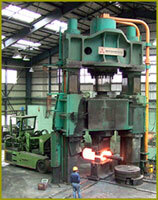 In addition to forge valve system, this forging press is accommodated with a high speed forging. 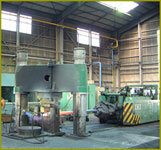 The system can provide forging operation with 180 strokes (maximum) per minute achieved. This machine forges bars and rings efficiently, when it is operated in the high speed mode, and is used in conjunction with a manipulator. 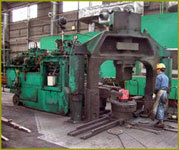 This machine can be also make other shapes, when it is operated in the oil hydraulic mode.